Raganjli is a source of musical compositions in well-known ragas as well as in many rare ragas of North Indian classical music. It consists of 112 Ragas with 150 compositions and every Raga is preceded by its description. The text of the compositions is from Gurbani and the pieces are mostly composed in the purist and rather intricate classical style with a few compositions in Kirtan style. My intention at the start of this project was to write a book containing fifty or so compositions based on around 20 of the more common Ragas. As the body of work progressed, I felt the need to extend the compositions to include some of the less well-known Ragas and, using traditional Indian notation in Punjabi script, I tried to adopt a more purist style than perhaps is commonly used in Gurdwaras today. Scriptures have been chosen which best suit the rhythm and mood of each tune. Whilst the level of difficulty varies, in general the compositions are targeted at those who are fairly well versed in classical music. My motivation was, and continues to be, purely personal pleasure. I hope that this work brings some pleasure to anyone who wishes to perform the compositions. Although it has taken five years to complete ‘Raganjli’, in a sense this book is the culmination of a lifetime’s experience of playing classical music. I hope that readers of Raganjli will find it instructive as well as entertaining. An expanded edition of Raganjli will soon be available in Hindi. 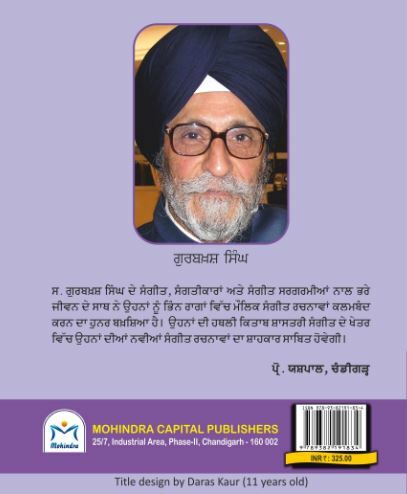 Raganjli is published by Mohindra Capital Publishers. I have known Shri Gurbux Singh since 1995 and have had the privilege of working with him on a number of projects in which his skills as a musician and as a composer have been invaluable. These projects have included his solo performances, examining and developing graded syllabuses. Therefore it gives me great pleasure to see his work Raganji. Shri Gurbux Singh was trained in India under Sardar Mohinder Singh who had won president award in Thumri singing. After moving to England in 1965 he continued to pursue his passion for classical music under the tutelage of Sardar Mohan Singh Musapuri and Professor Yash Pal of Chandigarh. He has taught students of vocal music voluntarily in his local Gurudwara for over 22 years, thus passing on his considerable knowledge and expertise. Since retiring in 2001 from teaching Engineering and Mathematics at Richmond-upon-Thames College he has devoted his time fully in the pursuit of music. Raganili has been a major project of Shri Gurbux Singh for the past 5 years. All those who are reasonably well versed in classical music will find Ragangli a source of beautiful compositions in well-known Ragas as well as in many rare Ragas. It consists of 112 Ragas with 150 compositions and every Raga is preceded by its description. The text of the compositions is from Gurbani and the pieces are mostly composed in the purist and rather intricate classical style with a few compositions in Kirtan style. For music lovers, teachers and serious students of classical vocal music, this book will be a valuable source of knowledge about both common and rare ragas as well as a source of unique and beautiful crafted pieces in the traditional classical style. Book Presentation to S. Harjeet Singh, President of Sarb Akal Music Society, Calgary.